We got reservations early because of it being a Trade Days weekend, manager was super helpful. We rolled in during a thunderstorm but the owners were out in it, helping us and another RVer get into our spots. The rest of the time went great, perfect weather. The park is well maintained and laid out well. They have added a few more sites and have just a little work to have them in good shape. Good wifi, a dog park, nice restrooms/showers with a laundry room. The road noise from Interstate 20 was the only drawback but we ran a small electric heater with the cool temps and barely heard the big rigs. Received a text message from the owners to make sure we arrived home safe and to thank us for staying. Hope to make this a annual trip to Canton Trade Days and we will stay at Wagon Train again. 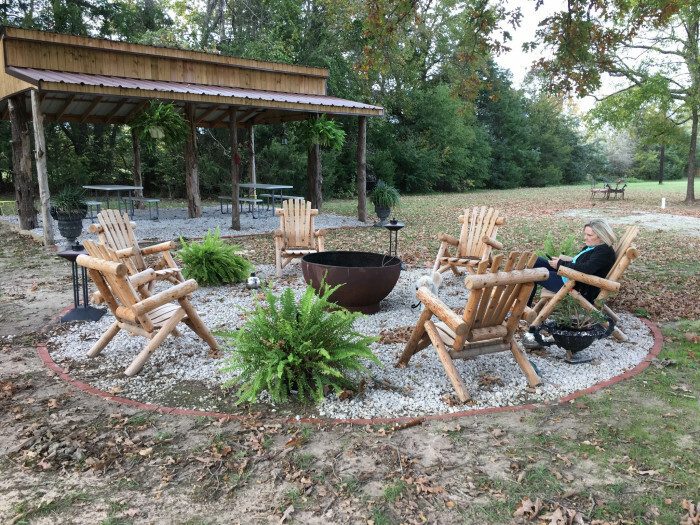 We camped at Wagon Train RV Park in a Travel Trailer. First Monday Trade Days in Canton are a must do, too much to see in one day. Canton is about 8 miles west with shopping and restaurants. Stayed 4 nights while vacationing and visiting family. Everyone was very friendly, campground was quite and very clean, a lot of full timers. Sites are sandy but mostly level. Full hookups, everything worked fine. WiFi was spotty and not much of a tv signal. There is boat launch on the Yellow River, beautiful river. Small playground, horseshoe pit, basketball goal and a clubhouse for events. The town of Holt is just up north of I10 a mile or two with a couple of stores. Bigger towns and restaurants are 15 miles in either direction on I10. Good place if you want to be away from the rat race and crowds. 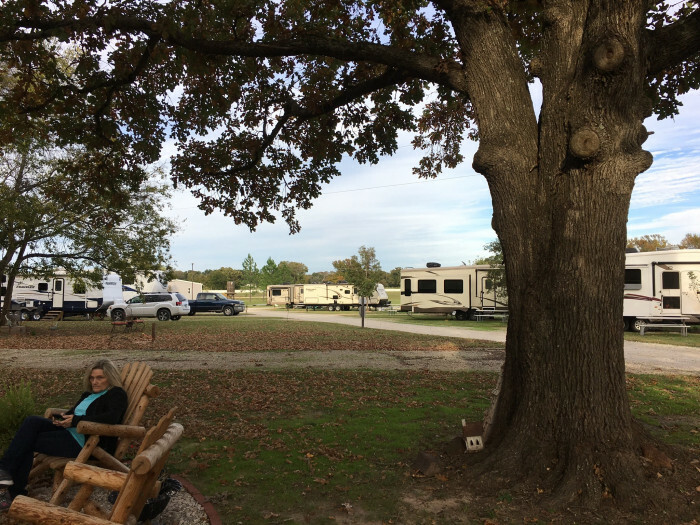 We camped at Rivers Edge RV Campground in a Travel Trailer. Nice river to boat and fish. A couple of stores in the town of Holt, 3-4 miles north. Bring movies or tv satellite. Small RV park in the edge of Columbus off Hwy 82. Very convenient, easy to find, a little tight on the entrance but negotiable for big rigs. Gravel drive and pads, level and in good shape. Mostly back-ins with about 4 pull-thrus. Full hookups, everything works but water spigot are low in the ground and tight to hook up. A lot of highway noise, you don't hear it with the ac running. Appeared to be mainly full-timers and some overnighters. No reservations and never saw the owner, just a registration slip and honor box. There is a laundry room and what I think was a storm shelter. The next exit down has restaurants, groceries and gas. Decent overnight stop but not a destination park. 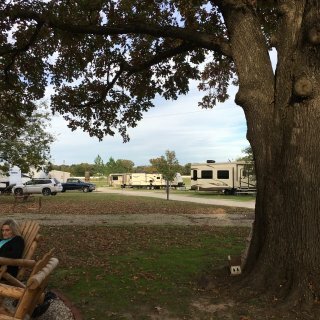 We camped at Parkwood RV Park in a Travel Trailer. Great place to get away, very quiet at night. Sites are spread far enough apart that you are not hearing your neighbor's conversations and you don't feel squeezed in. Hiking trails, small playground and boat launch are available as well as a bathhouse/restroom. Bathhouse was clean, a little dated but everything worked. We were right on the river, enjoyed watching the river traffic, 1 mile away from the dam & locks. There is a rail fence separating the campsites from the river, kind of a safety barrier. Couldn't pick up any antenna tv channels so need satellite dish or some movies, if you need entertainment. Not much around as far as stores so bring what you need. Several good sites next to the river and across the road is more wooded/shaded. If it had sewer hook-up, it would been even better. Dump station available on the way out. Good campground, we will be back. We camped at Service Park Campground COE in a Travel Trailer. Very nice State park and lake. Campgrounds are spread out along the lake and wooded hills. The roads are a little tight but not a problem-class A's had no issues. Sites have full hookups, picnic tables and grills but concrete pads are narrow. Most sites are shady, we were able to pickup about 15 tv channels, no cable/wi fi. Restrooms/showers are decent but need to be cleaned. Sites have space between them and everyone respected quite time. You can hear big trucks on the highway while outside but not irritating. What amazed me, never had any mosquito problem, little sugar ants were another story. Spray around anywhere they might access your camper. Water slide, beach/swimming area are great for kids, saw plenty of folks fishing too. It's a good overnight stop or place to relax for a few days. We camped at Roosevelt State Park in a Travel Trailer. A couple of gas stations right off the highway, downtown Morton is right up the road with a few restaurants and stores. Bigger cities about 20 minutes away. Stayed here Saturday through Tuesday just to get away from work and the stress on the daily grind. 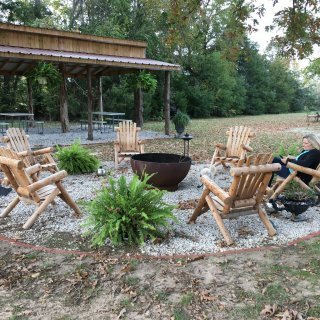 Great place to relax, not much of a cell signal or TV channels, bring some movies and games. Gentleman at the park office/museum was terrific, a lot of information and very friendly. We were the only camper on this section with him, until the last night. Concrete pad was almost level, no problems with hook-ups. Bath house older but clean and everything worked. Port Gibson is a few miles away so bring your provisions and grill. Saw deer and turkeys, and listened to the owls at night. Great place to get away. We camped at Grand Gulf Military Monument Park in a Travel Trailer. A lot of historic sites from Vicksburg to Natchez and along the Natchez Trace. The old cemetery on Greenwood Street in Port Gibson and the Ruins of Windsor are must sees. The Country Store in Lorman, just down Hwy 61, Mr. D's fried chicken is awesome! Nice RV park on the Styx river off I-20. Level concrete pads with good paved roads, full hookups. The owners and staff were super, talked with them several times while we were there. No cable, able to pickup several local tv channels, the wifi was touch and go. The shower/bathrooms were clean and only accessible with a code. The park is laid out well, a little close in some spots but easy to navigate. There is a community pavilion next to the river, if you wanted to hangout but all the other folks were quiet at night, a little highway noise now and then but not an issue. No pet poop problems, "pick up or pack up", very clean grounds. Would definitely recommend Riverside. We camped at Riverside RV Resort in a Travel Trailer. Short drive to Pensacola, Foley outlets and Spanish Fort.